"Quick and easy. Be ready to try to hold the relatives back. I usually have to make a double batch. I don't know where I got this recipe but its been a favorite in my home for over 30 years." Heat oil in a large saucepan over medium-high heat. Put 4 popcorn kernels into the oil and cover until popped; add remaining kernels to the saucepan in an even layer. Cover and remove from heat, about 30 seconds. Return to heat and gently shake pan back and forth over the burner until popping slows to several seconds between pops, 1 to 2 minutes. Remove from heat and transfer to a large bowl. Combine brown sugar, butter, corn syrup, and salt in a 2-quart saucepan. Bring to a boil, stirring constantly. Let boil for 5 minutes more without stirring. Remove from heat and stir in vanilla extract and baking soda. Stir well. Pour over the popcorn; mix until evenly coated. Transfer to a shallow oven-safe pan. 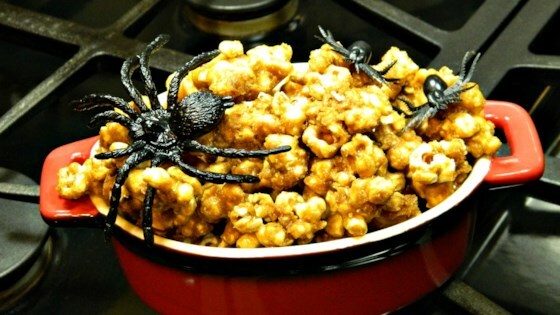 Bake in the preheated oven, stirring every 15 minutes, until a cooled piece of popcorn is crunchy, about 1 hour. Your popped corn should measure about 6 quarts. Easy, tasty and crunchy. I used 2 large bags of microwave popcorn. Quick and easy. I'll add nuts and some other mix-ins next time. I should have cooked more popcorn to pour it over. I used our air popper. But it was delicious, it just disappeared too fast. Easy and excellent! Rivals any popcorn you may have had on the boardwalk!